Being a Bridesmaid #Infographic ~ Visualistan '+g+"
Being a Bridesmaid can sometimes be almost as daunting as being the Bride. It is an honour. Your friend has bestowed this on you as a sign of how much she values your friendship and loyalty so it really is a big deal! If you haven’t been a bridesmaid before, it might be daunting if you’re not sure of what exactly the role entails. Never fear though as we have put together this infographic below which aims to showcase all that is required for the occasion and also for the build-up. 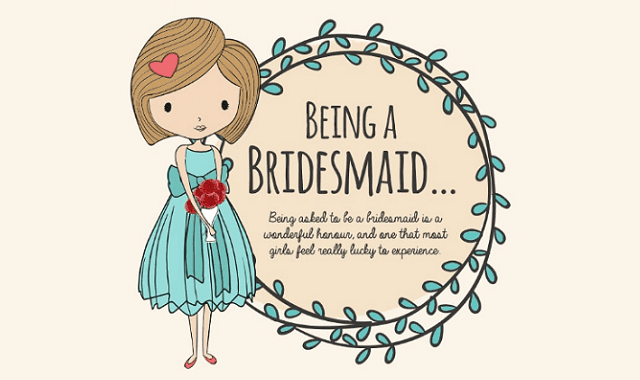 The main points of being a bridesmaid are to support the bride and ensure that she is well looked after in terms of her hen night/weekend, the run up to the wedding, and of course on the big day. The very best of luck and be sure to enjoy every moment of this wonderful time!